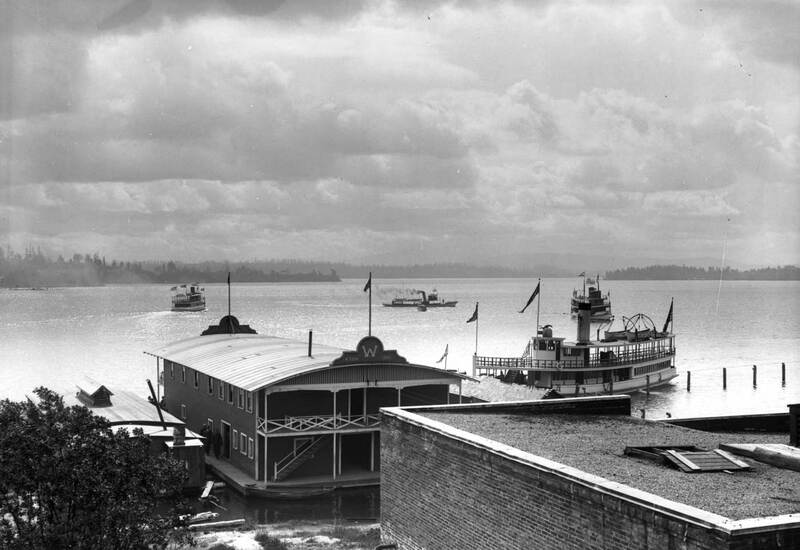 When the photo postcard purveyor M. L. Oakes selected this houseboat for his 667th subject in 1907 (or possibly 1908) there were many more floating homes on Seattle’s waterways than the tightly regulated 400 or so that now survive mostly on Lake Union. This charmer is one of a small community that was moored below the University of Washington on Lake Washington’s Union Bay, then still nine feet higher than Lake Union. Nearby was the student body boathouse with a dance hall and canoes to use. 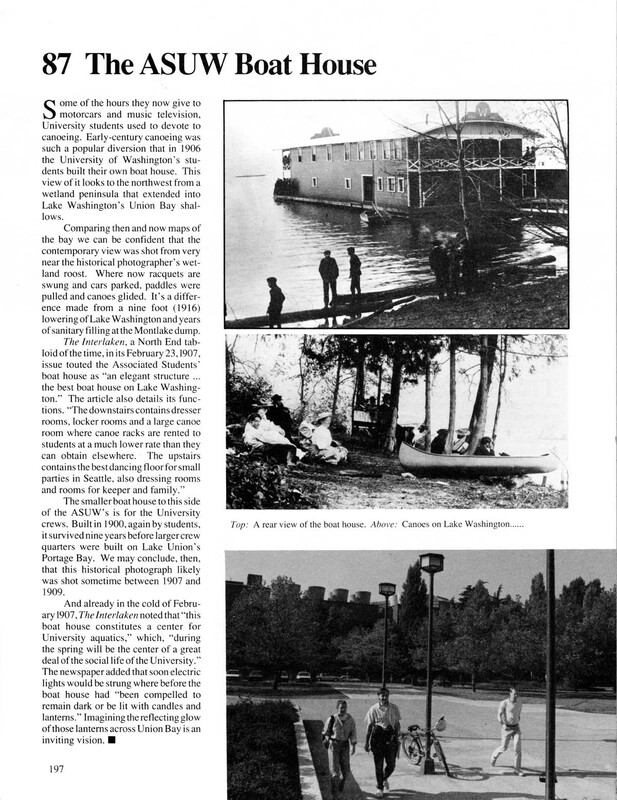 This happy shoreline of youth soon became a neverland when Lake Washington was lowered those 9 feet in 1916 and this floating retreat and many others around the lake had to either hope the new beach they were dropped to was as accommodating as the old one or find new moorage. At Madison Park some of the houseboats – a larger community of them than this – were pulled ashore and survive today as small homes. I do not know what became of this floating home, but I can imagine it being towed through the then new Montlake Cut and delivered to a new moorage in the large Lake Union community of houseboats. Perhaps some Pacific reader lives in it now or another reader will find it uncannily familiar and let the rest of us know of it with a letter to the editor. It is now 10 years since the Times wine expert (since 1967) and Pacific Northwest contributor Tom Stockley and his wife Peggy died in a plane crash. They had been floating homers. In 1995 Tom wrote . . .
For my approximation of the historical photographer’s prospect I chose the Wahkiakum Lane overpass of Montlake Blvd NE. It leads to acres of university parking. Bruce F. Miller obliged to pose with his Bacchetta Carbon Aero 2.0. This old friend was then testing his new bike on the Burke Gilman Recreation Trail. 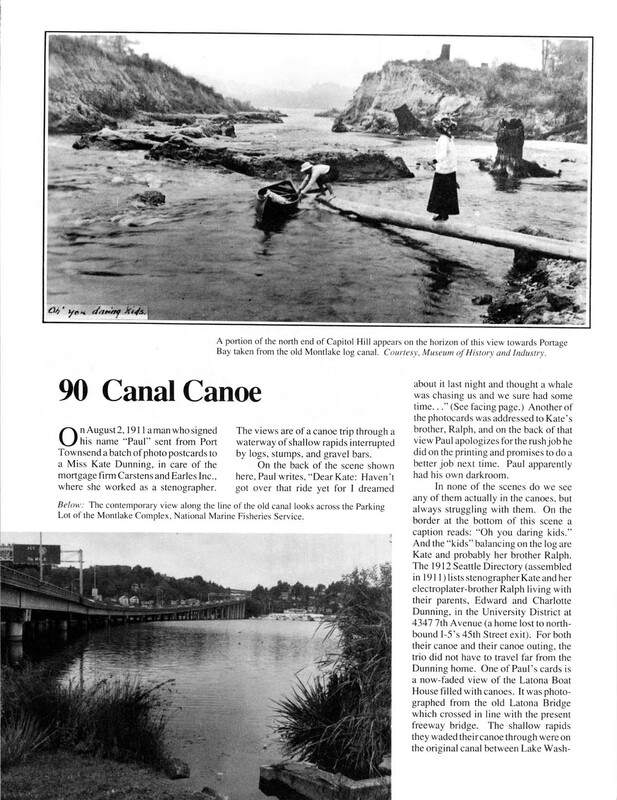 Jean – of this blog – was off in Europe when this feature first appeared in Pacific Northwest Mag. Consequently he has no chance here to ask “Anything to add Paul?” But I do – have things to add. 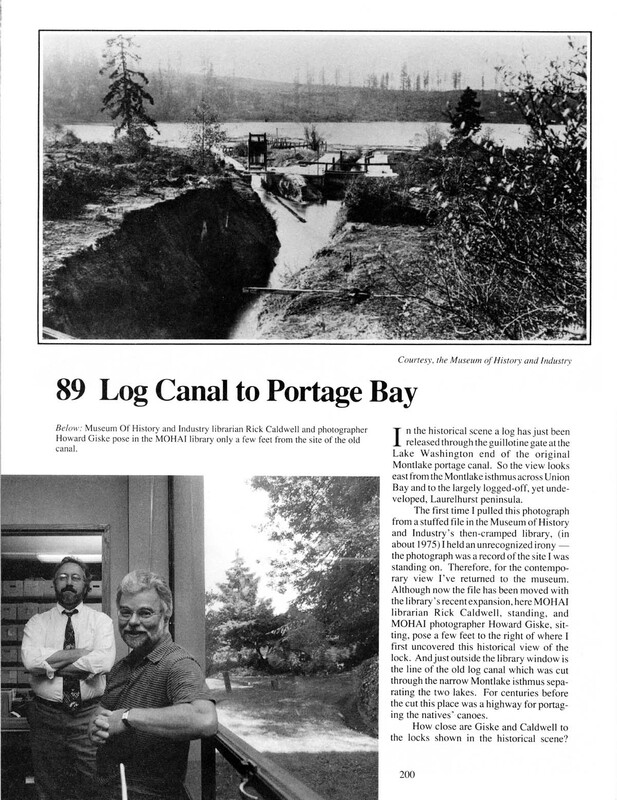 They are what I could more easily find of the many features – relevant to Union Bay or houseboats – I have pulled together over the last 28 years of doing now-then in the big pulp Times. 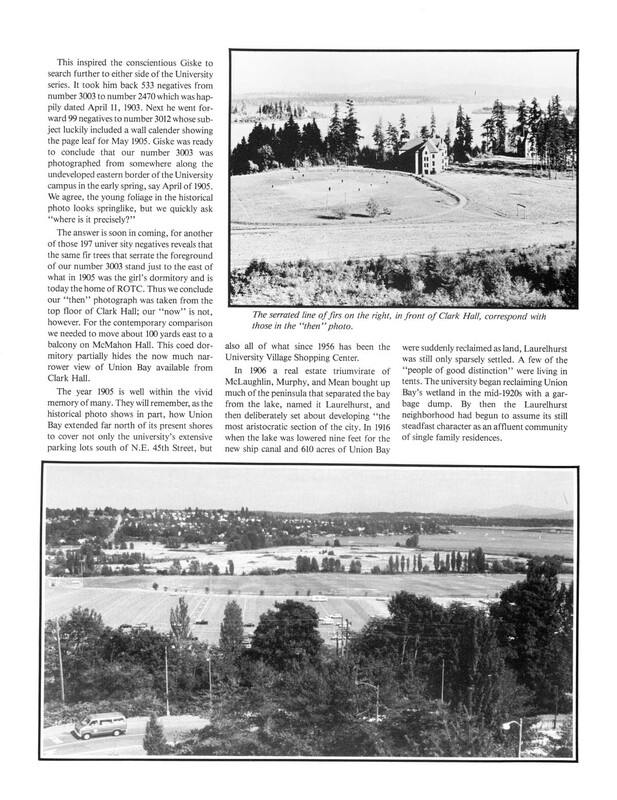 A few will be pulled from features that were part of the books “Seattle Now and Then,Vol 1” and “Seattle Now and Then Vol. 2.” Those will be obvious. They are lifted directly as designed from the books with the help of Ron Edge – of our “Edge Clippings.” Some wonderfully apt stories will be missing, but their time will come. Indeed, perhaps for the 30th anniversary of this feature in January 2012 we may have all 1500 or so features up, and all of them with “extras” and some with many. 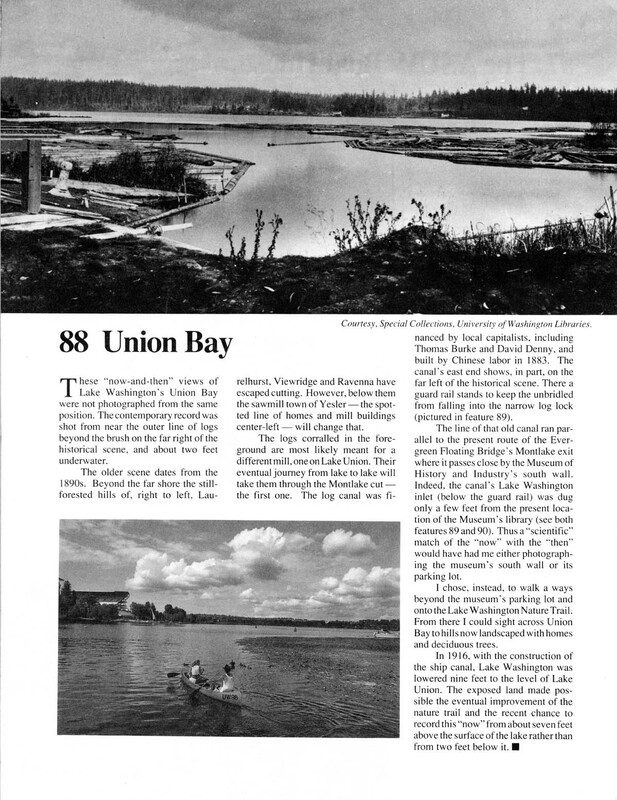 This splendid record of life on Union Bay before its bottom was exposed with the 1916 lowering of the Lake for the ship canal was probably photographed from the old Seattle Lake Shore and Eastern Railroad right-of-way, now the Burke Gilman Recreational Trail. 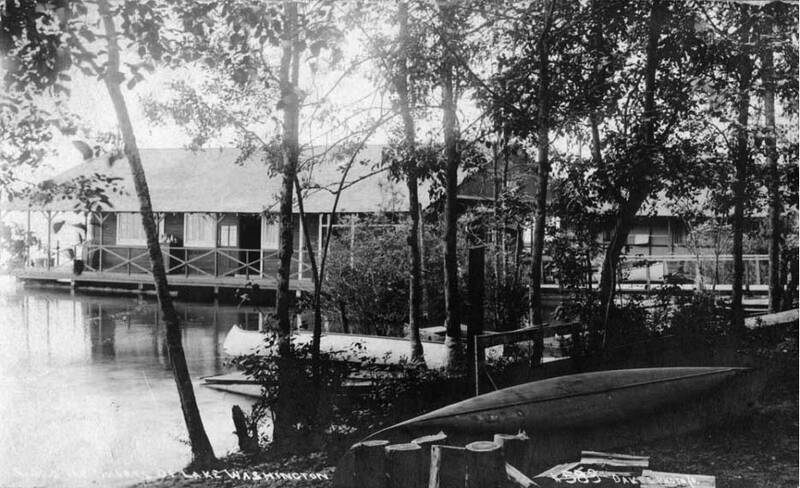 The boat house in the foreground was built by the school’s associated students in 1906. It included a dance hall, dresser rooms, lockers, canoe racks and quarters for the keeper and his family. 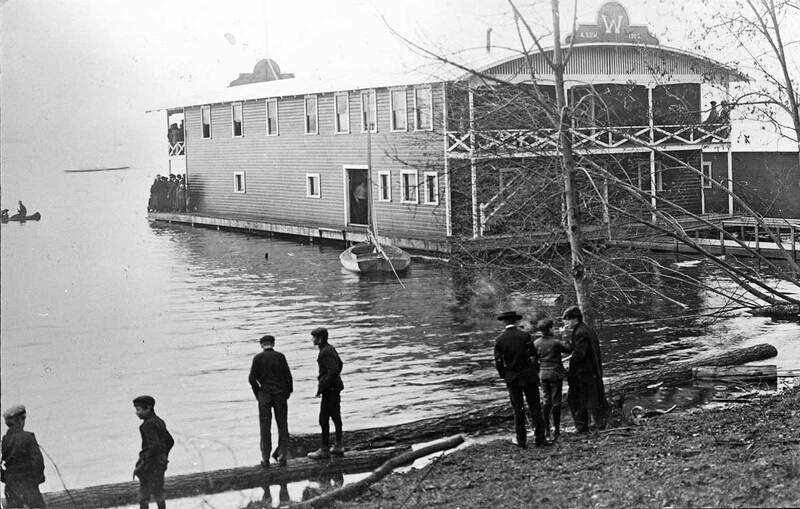 For the ten years it was moored here the ASUW Boat House was easily one of the most popular campus destinations. 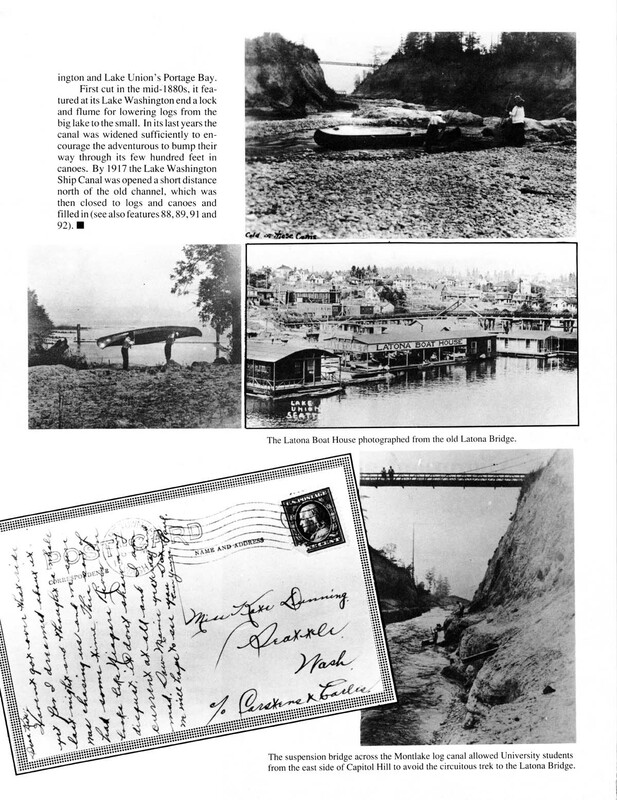 “Canoeing wooing” was then still a commonplace of Seattle dating and courtship. 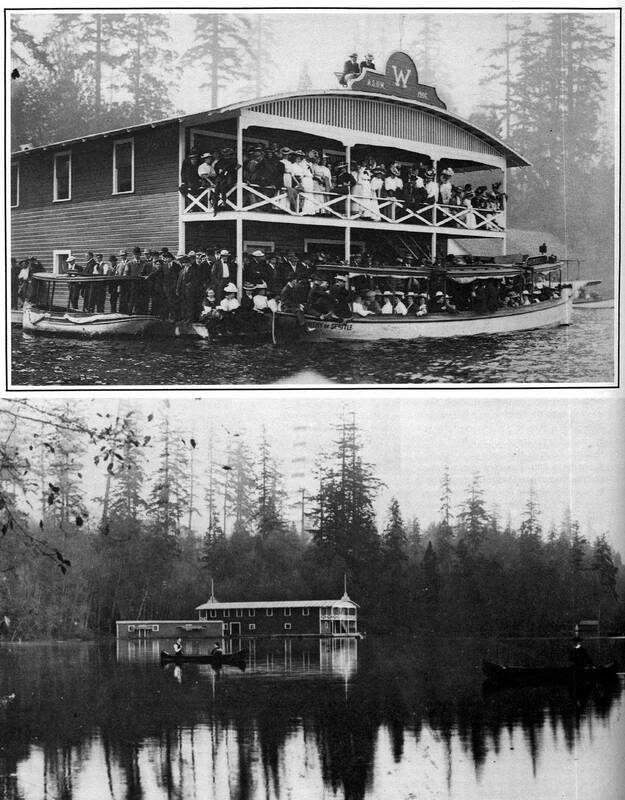 The occasion for the unusual congestion of Lake Washington “Mosquito Fleet” steamers shown here probably has to do the commuting of visitors to the summer-long 1909 Alaska Yukon and Pacific Exposition on the University of Washington campus. There are five lake steamers in the scene, but only four are readily seen. And, if I have identified them correctly, they are, naming them counter-clockwise from the boat house, the Wildwood, the Fortuna, the Cyrene and the Triton. All but the Wildwood belong to Capt. John L. Anderson who until his death in 1940 ran steamers and ferries on the lake for fifty years. During the fair Capt. Anderson and his competitors ran 15 minutes commutes between the fair’s landings on Union Bay and Leschi, Madrona, and Madison Park. 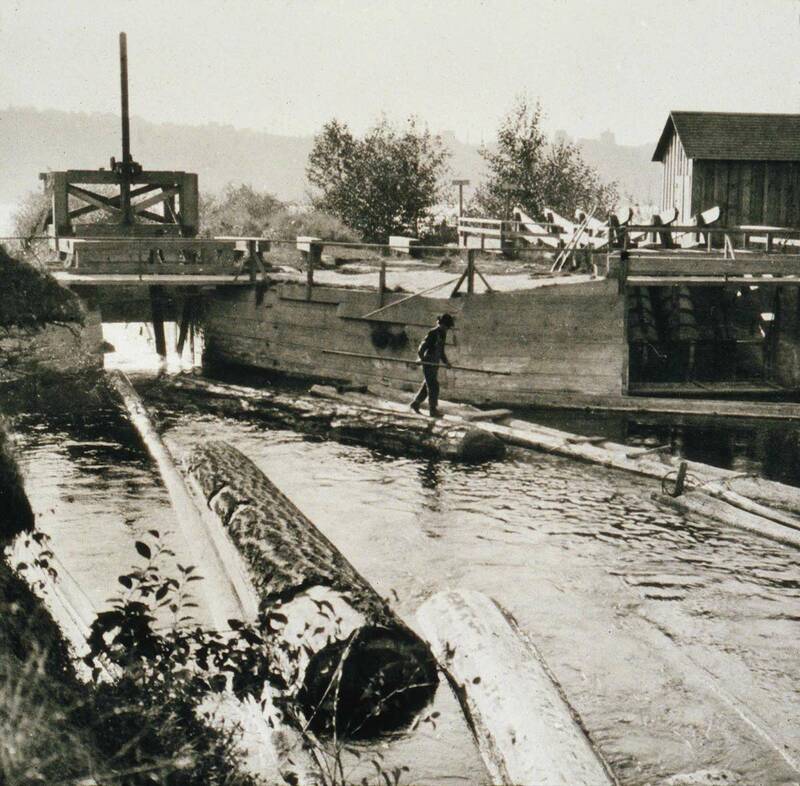 An estimated 1,500,000 passengers were handled for these quick hops and for the longer excursion around Mercer Island. Except for the Fortuna that is seen coming towards shore behind the Wildwood’s stack, all these vessels are empty. Perhaps, then in this morning scene, the Triton, farthest left beneath Laurelhurst, is returning to Leschi empty to take on more fair goers. The smaller Cyrene, at the scene’s center, is waiting for her chance to load up for an excursion, and the Wildwood has just left off passengers walking here towards shore along the north (left) apron of the boat house. Perhaps. Union Bay is now dedicated to student parking and recreation. Much of these park and play acres was reclaimed from bottom land by the Montlake Dump. 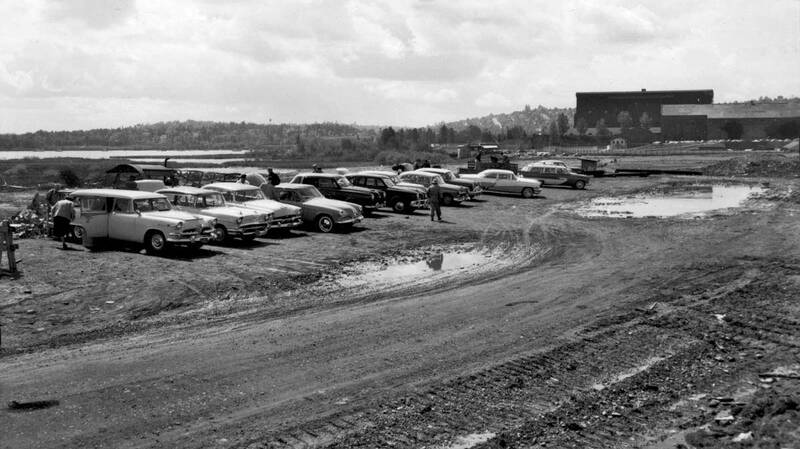 The dump closed in 1964. A mix of student and alumni enthusiasm that bordered on happy hysteria campaigned for Husky Stadium in the joyful return to spectator sports following World War One. The site was first aligned by University astronomers to set the axis of the stadium so that the sun would not shine in the eyes of the players – although almost everyone expected it to rain. 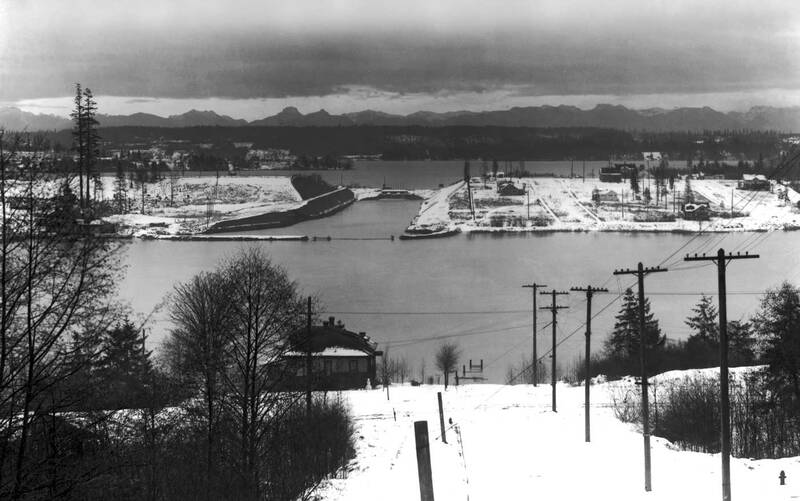 Using the same sluicing methods employed to hose gold from the hills behind Nome, Alaska and Denny Hill into Elliott Bay the stadium took only a little more than six months to complete. The work was finished 12 hours before the inaugural game against Dartmouth College on Nov. 27, 1920. The Tacoma photographer Chapin Bowen recorded this sweeping impression of that dark day when the University eleven lost to Dartmouth 28 to 7. The place, of course, was packed and many of the 30,000 seats were warmed by bodies that had earlier paid for the right to sit in them by subscribing into the building fund. The campaign copy read “Buy a Seat and Build the Stadium.” Name plaques were also offered for fifty and one hundred dollars. Since that first lost the Huskies have won about 75 percent of their games here, and the seats have multiplied to 75,000. In 1968 the grass was replaced by Astro-Turf – a first for a major college. Visiting teams then both stepped onto ersatz grass and into strange shoes. The school had to stock an extra 200 fitting pairs for their opponents. For those who are counting, first in 1923 and thirteen times since the Huskies have made it from here into the Rose Bowl. Perhaps most impressively the schools’ athletic department claims that Husky Stadium is consistently voted “the most scenic football structure in the nation.” That probably means more the view from the stadium than of it. PLEASE CLICK YOUR MOUSE twice OVER THESE STORIES. They will then appear big enough to read with comfort. If we could find the "now" to place this, it would show the main bridge that crosses from the U.W. campus to Hec Ed pavilion. When the University of Washington moved north in 1895 from downtown, the new site was commonly referred to as the Interlaken Campus. Views such as the one above confirm the name. 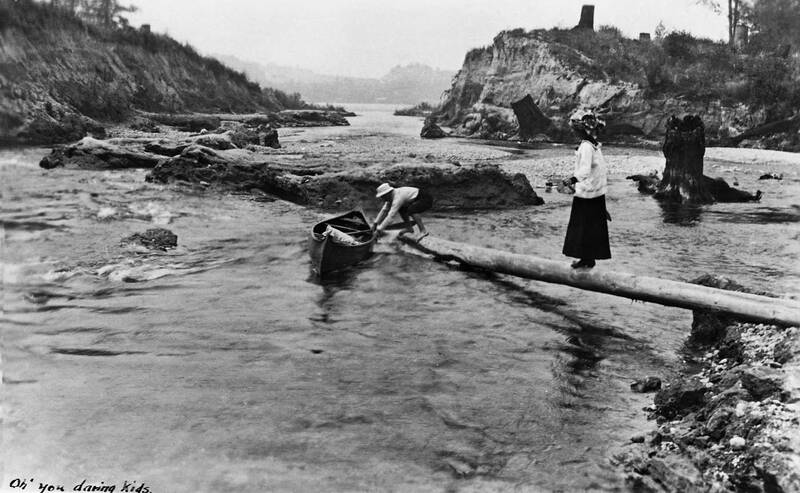 Most likely this scene was photo­graphed during or soon after the makeover of the campus for the 1909 Alaska­ Yukon Pacific Exposition. The unnamed photographer looks southeast across Union Bay. 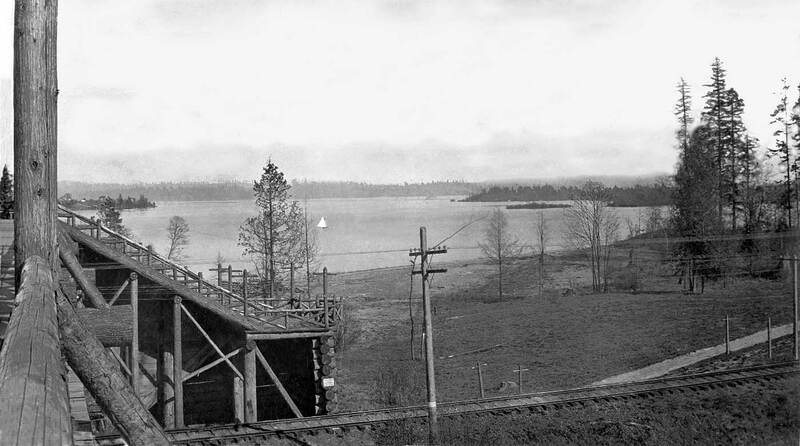 Madison Park is right of center, and Webster Point, the southern extremity of Laurelhurst, shows on the left just above the stairway that descends from the pedestrian trestle. Between them we look across Lake Washington to an eastside waterfront softly filtered by a morning haze that hangs over the lake on what is otherwise a bright winter day. This is Medina — or will be. In 1909 no palatial beach homes or bunkers attract our modern flotilla of gawkers. 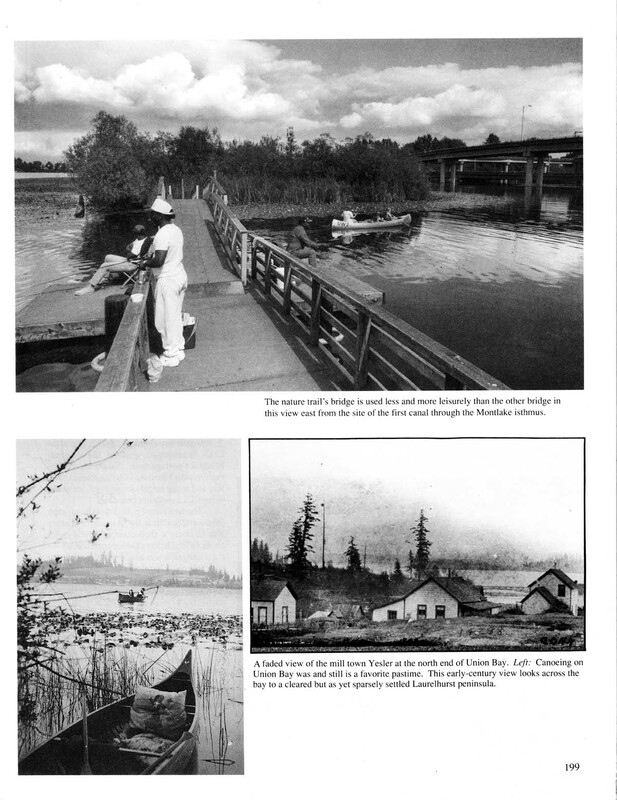 Lake Washington is here at its old level be­fore it was slowly dropped 9 feet in 1916 for the opening of the Lake Washington Ship Canal. At the old lake level the unnamed island right of center was still separated from Foster Island, behind the screen of trees on the far right. Now joined, they can be explored on the Arboretum Waterfront Self-Guided Trail. We might have wished that the photographer had shown more of the trestle. It was most like­ly constructed for access to the shore, groomed as a picturesque retreat for visitors to the expo­sition. Its construction of both peeled and un­hewed logs repeats one of AYP’S lesser ar­chitectural themes — the rustic one. 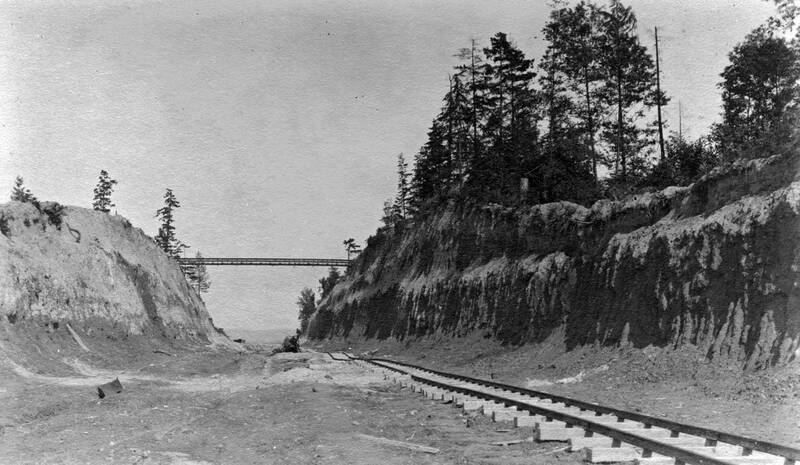 The trestle spans the old Seattle Lake Shore and Eastern, the railroad that opened the hinterland of King County in the late 1880s. 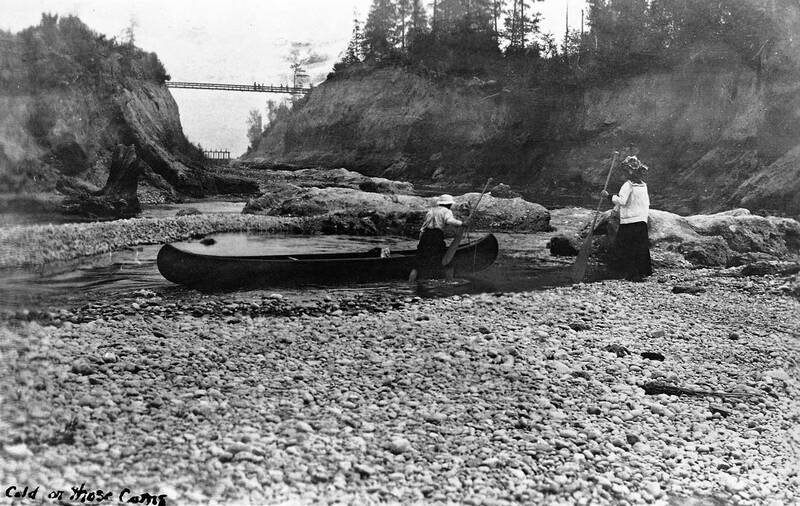 It first reached this point beside Union Bay in the fall of 1887. 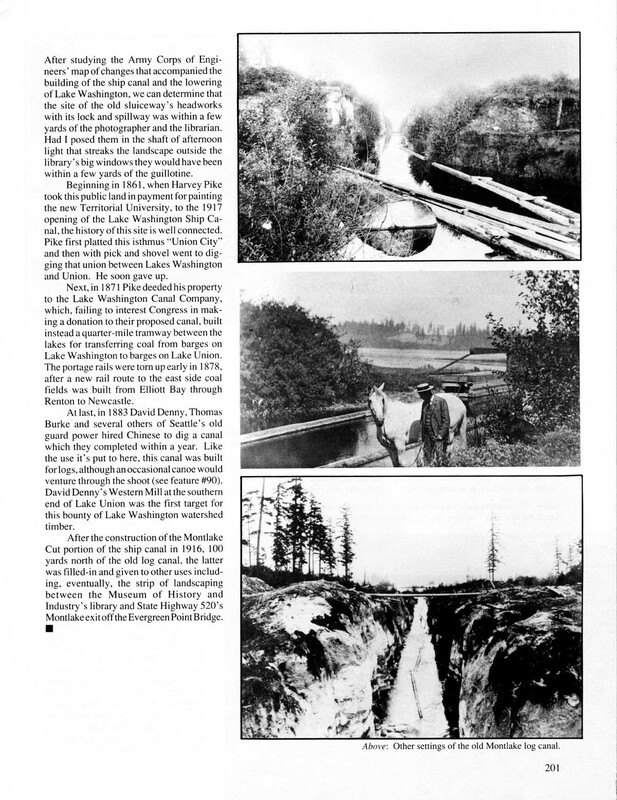 The above is an example of a “clip” cut from the Pacific Northwest Mag. for – my handwritten scrawl has it – Feb. 18, 2001. (Note that the ASUM BOATHOUSE appears on the left of the above view, just right of the couple on the bench and obscured by a haze holding over the bay.) The features that follow were lifted from Seattle Now and Then Vol. Three. Logs about to be "let loose" through the gate or lock shown here and down a flume from the log canal and into Portage Bay. Ca. 1907. 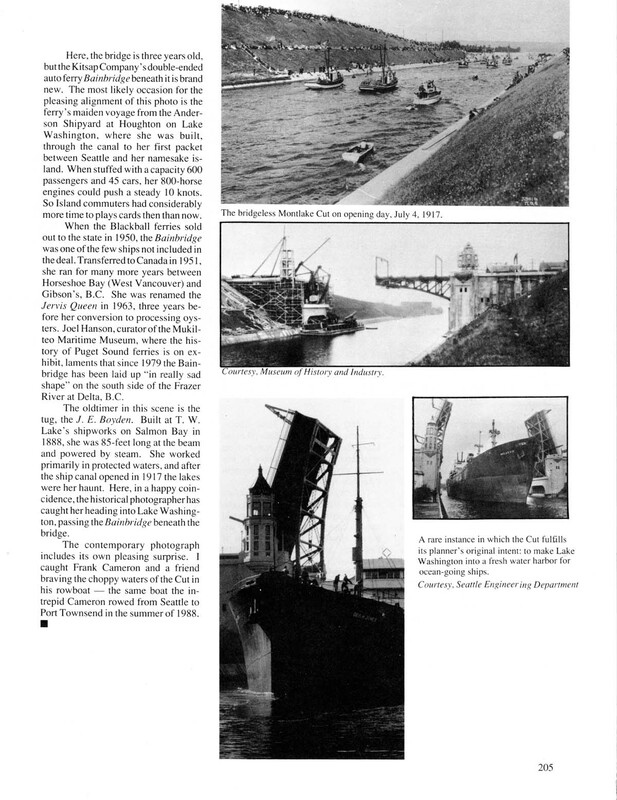 “Roaring like a cataract, hundreds of tons of water from Lake Union, unharnessed by a cut in the cofferdam, plunged through the crumbling barrier of earth into the portage channel at 2 o’clock yesterday afternoon marking the formal opening of the eastern end of the Lake Washington canal . 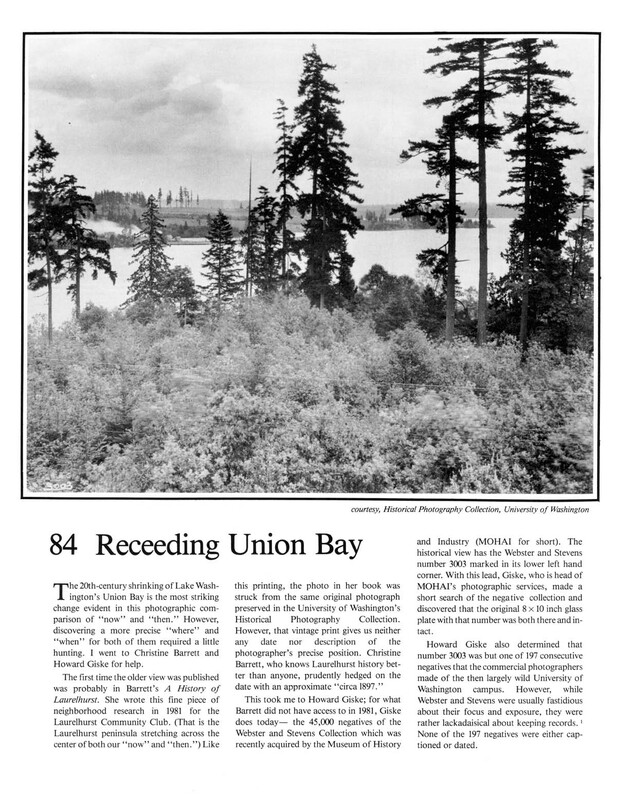 . . A cheer went up from the several hundred persons who had gathered to witness the breaking down of the barriers that have separated Seattle’s two great lakes for unnumbered years.” So reads The Seattle Times for Saturday, August 26, 1916. This view looks west towards the north end of Capitol Hill and above that some of the Wallingford Neighorhood. The concrete lined Montlake Cut is behind the photographer including the temporary gates at its eastern end. There from the following Monday August 28th forward into October the waters of Lake Washington were slowly released lowering the big lake nine feet to the level of Lake Union. 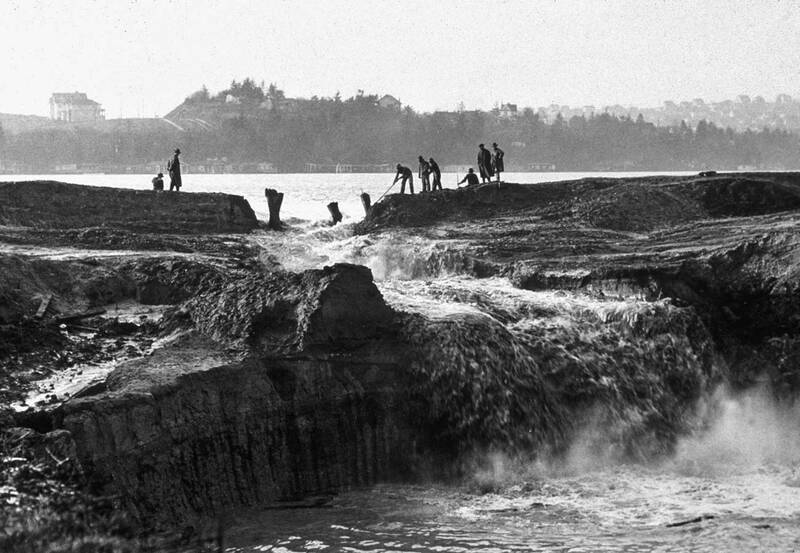 The work of dredging the two ends of the cut progressed speedily and on May 9, 1917 the navigable channel between Lake Union and Lake Washington was opened. 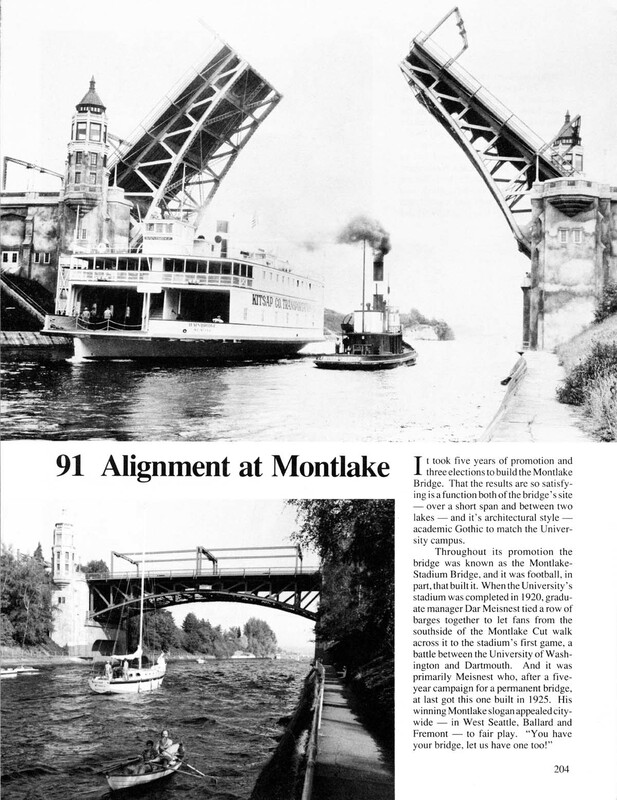 The formal dedication of the entire Lake Washington Ship Canal followed two months later on Independence Day. 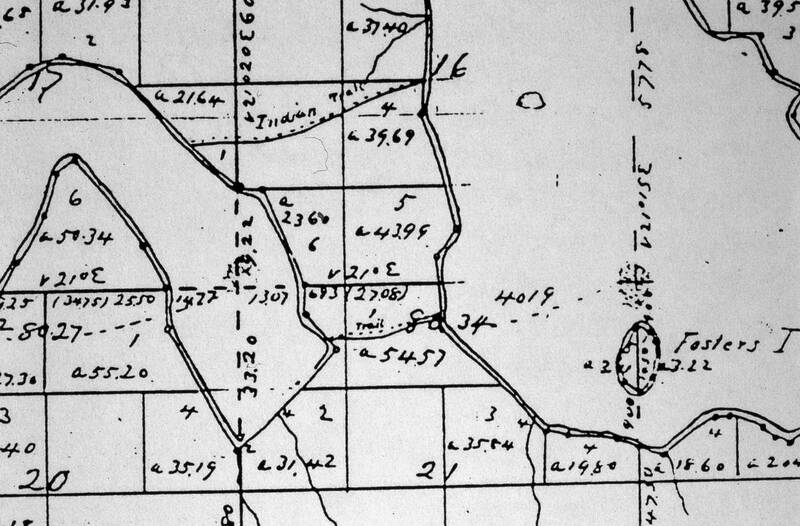 The federal land survey reached the Seattle area in the 1850s. This map from that survey shows the first more-or-less accurate shoreline of Portage Bay and the Montalke Isthmus that separates it from Union Bay. Note that Fosters Island, lower right, already has its name. The lower of two Indian trails across the isthmus runs roughly along the path of the future log canal. 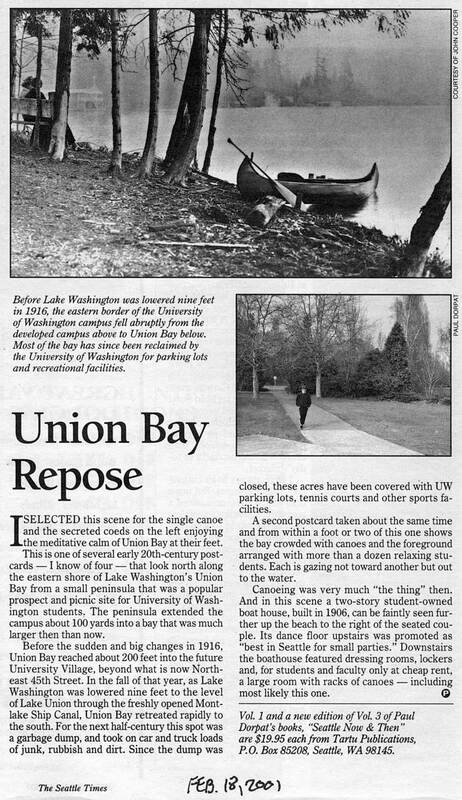 The longer trail above it cuts through the future University of Washington Campus, reaching Union Bay near the athletic department’s offices just north of Hec Ed Pavilion. A bit of the future Laurelhurst neighborhood shows upper right. The width of the map is a little more than 2 miles. 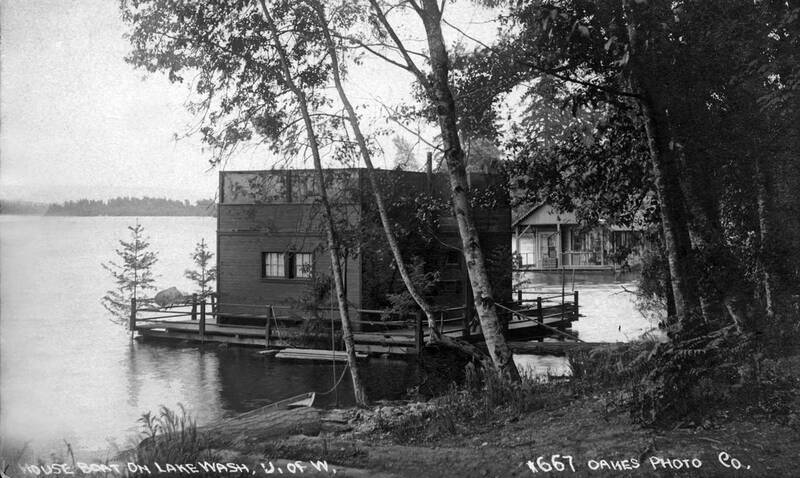 Now it is time to go to bed and so we we choose to rock to sleep in this houseboat behind a screen of shore trees included here in another of photographer Oakes recordings along the western shore of Union Bay before the big lake was lowered. Finally, please forgive the typos. In addition to the greatly reduced number of Seattle houseboats, haven’t the demographics flipped in the past century? Most of the folks living on the water in those days, couldn’t afford a studio apartment in surrounding neighborhoods today. Houseboats have become a status symbol of the wealthy. Did the Winslow elite ever torpedo those live-aboards in Eagle Harbor? I’ve not followed the Winslow War although one of the combatants did explain it to me about a year ago. I heard no more about it, nor would I know – easily – who it was who told me. Wages of age. The houseboat that Tom lived in I’d lived in briefly earlier – in late 1966 or early ’67. It was owned by the brother of Meryl Clemmens who was once of the stalwarts on the Helix “staff” during its first year. (In writing about Helix I feel like I should put everything in quotes. “Staff” does not do it. But what else I wonder can be said for the happy clot of early enthusiasts who put the first issues out?) There was a bohemian caste to much of the houseboat community in the 60s, which means they could not afford high anything. More of the floating gentry own them now, although I’d bet that not many of them are filthy rich. Those prefer more secure surrounds to roll in their dirt.